Jim is one of the world’s most experienced and respected explorers and has clocked up over than 30 years of polar travelling and expeditioning; thousands of miles mostly on nothing but skis, dragging his world behind him. Few, if any, have that breadth and depth of experience in extreme environments. His guiding, safety and survival expertise is widely employed, from the BBC to Hollywood film crews, on location all over the world – hot as well as cold. 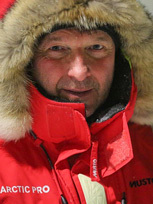 With a career spanning environmental science, the military, commerce and fire & rescue, Jim has selected, trained and led highly successful teams from top-level corporations, through high-risk polar expeditions, to critical lifesaving situations - where effective leadership and hands-on teamwork are paramount. He has a passion for leadership and getting the very best performance out of individuals and teams, at any level. 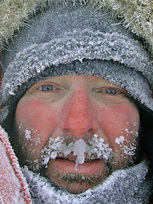 In 2001 Jim founded the "Ice Warrior Project" an organisation that gives "ordinary" people the opportunity to become polar explorers and achieve extraordinary feats of endurance and endeavour. Through Ice Warrior, he develops people, discovers global change and delivers the stories to audiences worldwide in a way we can all understand, fostering a much better understanding of the world we live in and on; ultimately helping us to survive. In 2006 he was ITV News' own "Ice Warrior", reporting the reality of climate change directly from the Arctic Ocean to international audiences. The story will continue next year as he attempts the last, so far unattained, World First in polar expeditioning - to be the first person to reach the very centre of the Arctic Ocean - the Arctic Pole or Northern Pole of Inaccessibility. Jim lives in Ascot with his faithful dog, Flashie; Royal Berkshire, UK and has a son Mac, two daughters Helen and Kirsty and his first grandson, Lachlan! Leadership in such pressured times - which style works best? We were delighted when Jim agreed to speak to our Executive Team and we were completely gripped when he shared experiences from his truly-remarkable career, from funny and emotive to absolutely terrifying. Jim has a wonderful insight into people and how to motivate them which coupled with his strong determination to succeed makes him an excellent leader. He was an inspiration to all of the team and certainly put into perspective how minor our challenges are when compared to the challenges of surviving a polar exploration. The tales of Jim’s many Arctic expeditions are unique and thrilling. They are relevant to everyone that has undertaken a personal challenge, the fear of failure or the sacrifice for success each connect very powerfully with the audience. There are some powerful learning’s for the commercial world. Considering the extreme danger inherent in the environments in which Jim McNeill is required to work he calmly turns his experiences into an enthralling, engaging and often very amusing talk which had everyone on the front of their seats throughout – most of whom were surely thinking “I’m glad it was Jim out there, not me”. Jim is evidently very skilled and very brave and he reached both the young and adults in the audience. I cannot recommend involvement with Ice Warrior highly enough. This is an extremely professional, committed and driven organisation which has much to teach people about how to achieve their personal and business goals.